To hear Army veteran Troy D. Walker tell it, Dog Tag Furniture’s mission to aid vets began after a service buddy killed himself and the family couldn’t afford a funeral. The Department of Veterans Affairs can only provide a few hundred dollars, the Minnesota man told “Fox and Friends” on Sept. 23, 2017. “The body was going to go unclaimed and be put in a baggie,” Walker said. Walker recalled going into debt to help pay his friend’s funeral costs and then realized no organizations existed to solely help fund veterans' funerals. Roughly six years later, Dog Tag Furniture builds and sells wooden American flags and other patriotic products, billing itself on social media and TV interviews as an organization funding veteran funerals via donations and wooden flag sales. “The money goes to pay for the funerals of these families who cannot afford one,” Walker told “Fox and Friends” during a return appearance on Nov. 22, 2017. “I hold the personal responsibility to make sure every dollar I received goes out to funerals," he said. But now, Walker, his wife Ranemma and Dog Tag Furniture are under investigation by the FBI and U.S. Postal Service amid allegations of money laundering and wire fraud in “a scheme to defraud donors who made charitable donations to their company,” according to court records. “Troy Walker...both solicited donations to Dog Tag Furniture and sold wooden flags to customers of Dog Tag Furniture by falsely representing to donors and customers that Dog Tag Furniture was a charitable organization and that all of the proceeds of donations and sales would be used to provide funerals for military veterans,” according to a sworn affidavit attached to a federal search warrant request from last month. “Instead of using their money to pay for funerals for military veterans, Troy and Ranemma Walker used a significant portion of the money for their own purposes," the affidavit added. “Personal purchases” allegedly included tattoo parlor payments, private school tuition for the Walkers’ children, $9,000 at Disney resorts, $5,000 in “food and entertainment expenses” and $7,000 to a law firm representing the couple “in connection with a dispute with the City of Norwood Young America,” according to the affidavit, which Military Times obtained from the U.S. Department of Justice. Walker has not been charged with a crime and the federal probe into misconduct allegations noted in the affidavit continues, according to Department of Justice officials. Although the charity received about $490,000 in sales and donations from August 2017 to July 2018, Dog Tag Furniture allegedly covered the expenses of just two funerals at a total cost of $3,295, federal authorities allege. Walker, 38, declined to comment on the allegations through Robb Leer, his Minneapolis-based spokesman. The Walkers paid for other funerals, but those payments came out of their private accounts, he said. Because federal authorities have seized their electronic records “we’re kind of handicapped in that,” Halberg said. We're wheelin' and deelin' today at the Dog Tag Furniture booth in Big Al's Swap on main in Sturgis. Last day to get some great deals! The federal search warrant affidavit claims that Walker told radio host Glenn Beck during an April interview that his organization pays an average of $3,600 per funeral and has funded about 200 of them but law enforcement "has found no evidence of Dog Tag Furniture providing any funds for other funerals, including the funerals Walker specifically referenced on social media, such as…an unnamed female Minnesota National Guard member” and two others. About $17,000 in Dog Tag Furniture funds instead went to pay Walker’s mortgage “after the residence went into foreclosure in or about August 2017,” according to the affidavit. Dog Tag Furniture was founded in 2015 as a for-profit corporation, according to the federal search warrant affidavit. It was initially created to provide a second income to bankroll a future trip to Disney World, but turned altruistic after Walker’s friend killed himself, according to the organization’s website. Walker applied for tax-exempt, non-profit status in September 2017 and received an approval letter from the Internal Revenue Service in February, a copy of which was shared with Military Times. Although walker told Beck during his radio interview that neither he nor his wife drew salaries from Dog Tag Furniture, about $90,000 was transferred from the organization’s checking account to the Walkers' personal coffers between August 2017 and July 2018, according to the affidavit. The transfers occurred when "the Walkers’ personal bank accounts had limited other sources of income,” wrote Christine Kroells, a U.S. Postal Inspector, in her affidavit seeking a search warrant. The affidavit states the couple received unemployment benefits and what appeared to be worker’s compensation payments in 2017 and 2018, but Walker denies they received unemployment assistance. 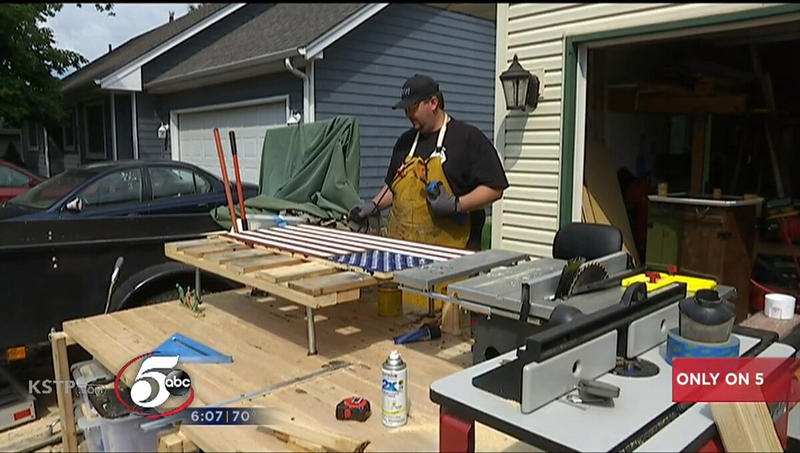 Army vet Troy Walker told KTSP-TV in Minnesota last year that he raises money for veteran funerals through his company, Dog Tag Furniture. Now, the feds are investigating whether Walker and his wife funneled the proceeds to themselves. (Screenshot courtesy KSTP-TV). During the Nov. 22, 2017, appearance on Fox and Friends, Walker said he nearly lost his home a few months earlier but “a donor stepped forward and got me caught up on my mortgage” after his initial appearance on the show. “I was getting into so much debt with this flag building business,” he added. That contribution was part of a flood of Dog Tag Furniture purchases and donations Walker reported receiving after his first Fox and Friends appearance. Dog Tag Furniture’s website crashed after that first appearance, he said, with folks sending pledges ranging between $5 and $5,000. “Within five minutes of me being on the show I found out my voicemail can only hold 112 messages,” he added. While welcoming him back for his second spot on the show, Fox host Ainsley Earhardt announced that “Troy’s website received over $100,000 in sales, thanks to you, our amazing, generous viewers," in the hours following the first appearance. “I love that even when you were in dire straits, you use all the money still to pay for funerals, because you get your paycheck from the military,” Earhardt said. “Thank you for fighting for our country,” she added. Dog Tag Furniture portrays itself as an organization where veterans help veterans. 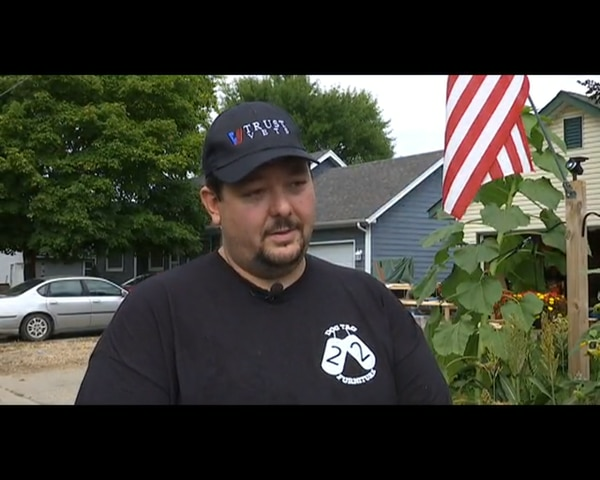 Its logo features two hanging military identification tags forming a “22,” an oft-reported estimate of how many veterans kill themselves each day, and Walker notes his Army service in videos on the organization’s website. But military service records show it’s been a long time since Walker drew Army pay. Walker enlisted in 1999 and left active duty in 2002, and his most recent rank change was to private, or E-1, in November of 2001, according to service records. Walker disputed the 2001 demotion in an email forwarded by his spokesman. Walker said he served in the “Inactive Reserves” until 2009, when he was honorably discharged. Army officials reported he was in the Individual Ready Reserve from 2002 to 2007. Army officials said he was administratively separated from the service but declined to characterize the nature of his discharge. “All my battle buddies have seen my interviews and have NEVER publicly disputed anything I said in regards to my service,” Walker said in an email forwarded to Military Times. The federal search warrant executed last month does not appear to be the only time law enforcement has searched Walker’s home. Carver County Sheriff’s Office deputies combed it as well, according to an April press release from the agency. In March, authorities said Walker provided Carver County deputies with a suspicious email he asserted was written by an official from his town of Norwood Young America, about an hour’s drive from Minneapolis. But deputies determined the message had been sent through Walker’s own IP address, “suggesting the email had come through Walker’s own computer(s),” the press release states. An email from someone named “Jacob” also claimed Norwood Young America officials were harassing Walker but county investigators found it also came from Walker’s IP address, the agency wrote. Like federal probes, local investigations often peter out without prosecutors indicting their targets. Angella Erickson — the criminal division manager for the Carver County Attorney’s Office — told Military Times that the matters raised in the sheriff’s release remain under investigation but there are “no current pending charges” against Walker or his wife. In an email shared with Military Times through his spokesman, Walker said the Carver County allegations are “actually what started this investigation.” In fact, he wrote, the county charges “were dismissed shortly after for lack of evidence” and he blamed local prosecutors for instigating the wider federal probe. Erickson disputed Walker’s allegation and said local officials did not contact federal law enforcement about him. “To my knowledge, the Carver County Sheriff’s Office is not involved with any investigation by the FBI,” she said.